Improve your Spanish up to 10x faster! Kwiziq is an “AI language coach”, a state-of-the-art tool for language learners designed to help you improve your Spanish skills faster than ever. Kwiziq combines artificial intelligence with scientifically proven methods to dramatically accelerate the language learning process. In fact, during a recent survey, our students reported learning speed improvements of up to ten times! 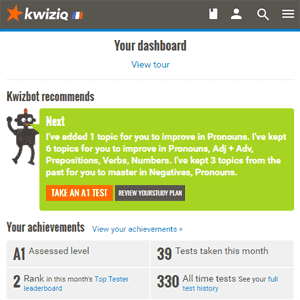 Kwiziq is designed for “post-beginners”, so if you already know some Spanish, then Kwiziq is for you. Once you move past language basics, it can quickly become a struggle to find material suited to your specific knowledge. As students learn, their needs quickly diverge: everyone needs to practise and fix different things. Kwiziq solves this problem by learning exactly what you know and don’t know, so that it can help you practise exactly what you need to. 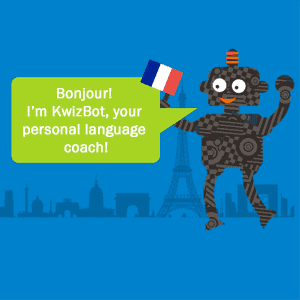 Our A.I., KwizBot, acts as your very own language coach, recommending what to work on and tirelessly designing practise kwizzes for you based on your evolving needs. Kwiziq helps you whether you’re self-studying or in a class or course. And if you do have a teacher or tutor, Kwiziq can help you work more effectively together. Best of all, our basic account (limited to ten kwizzes per month) is free. If you find it useful and want to learn faster, our Premium packages give you unlimited kwizzes. You need to know where you are before you can work out where to go next, so the very first thing you’ll do after signing up is to take our CEFR level test. It starts from beginning Spanish and goes all the way up to advanced. We test key indicator areas to determine your approximate level according to the Common European Framework of Reference for languages (CEFR). Once you have taken the test, KwizBot will start to build up a picture (your “brainmap”) of what you know, don’t know or may have mislearned. He analyses and creates a personalised studyplan for you and will generate short kwizzes to help you practise what you need to. No matter your level, you’ll be given a starting point to focus your learning, whether you’re A0 or C1 or anywhere in between. Every time you take a kwiz, KwizBot will update your brainmap and studyplan. KwizBot creates and maintains your brainmap and personalised studyplan, updating them every time you take a kwiz. He’ll make fun, short kwizzes focused on the topics in your studyplan that will help you learn as fast as possible, skipping areas he determines that you already know. 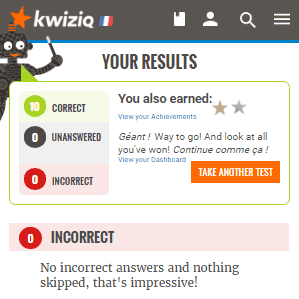 After every kwiz, KwizBot analyses your progress to determine whether to keep the current topics or pick new ones. You always get exactly what you need to improve at your speed, not someone else's. KwizBot will occasionally bring back lessons so that you don’t forget things you learned earlier. Each Kwiziq lesson is clearly laid out and teaches you by example, showing you sentences that use particular constructions important to your Spanish learning. You can click any example to listen to it being spoken aloud to ensure your pronunciation is correct. Many of the lessons also include videos selected from the best educators on the web. After each kwiz, you’ll be shown what you got right, the mistakes you made, and any questions you skipped. The relevant lessons will be presented to you at the exact moment you need them to learn most efficiently. As well as kwizzes, Premium users receive weekly weekend challenges by email, while free users get them once a month. The weekend challenges are carefully designed by our world-class Spanish language experts and challenge you to “integrate” what you’ve learned; in other words, to practise pulling together grammar and vocabulary to both comprehend and produce complex Spanish sentences. These self-marked exercises will help you quickly identify any gaps in your knowledge and work out exactly what you need to work on. 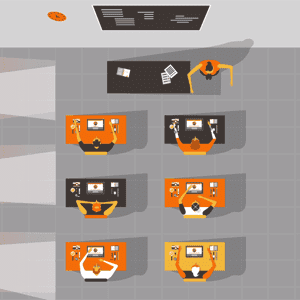 Your learning dashboard is where all the action happens. Here you can see what KwizBot currently recommends you study and take kwizzes which he’ll make on the fly for you. You can see a high level view of your progress and achievements here, plus your improvement timeline, test history and more. KwizBot uses sophisticated algorithms to identify - with laser-like precision - the areas of the language that you need to work on. Kwiziq covers pretty much every conceivable grammar rule you will need to master. Over time, KwizBot will guide you through them all, keeping track of how confident you are in each area in your brainmap. 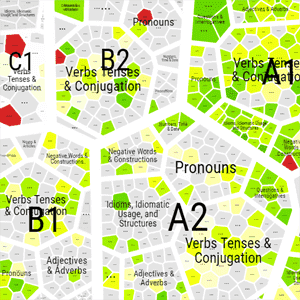 Premium users can access an interactive version of their own brainmaps. These are fun to explore and can be very helpful for planning your own studies. They’re also a powerful way for teachers to see what students need help with. If you want more control over what you study and practise, you can use the Notebook feature to keep track of topics that are important to you and then kwiz against them. KwizBot will continue to smart-select questions from your chosen topics based on your needs so that you always have the choice between guided and self study. Free accounts include one Notebook; for a more sophisticated approach, you can create multiple Notebooks by upgrading to a Premium package. You can find lessons using the search bar on your Dashboard, or navigate all the lessons in each level in the language library. 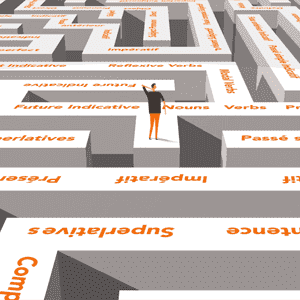 You can also explore lessons via the grammar glossary. Under each category or term, you’ll find relevant lessons and can add any of them to your Notebook with a click. Learning a language is a huge commitment: there’s so much to learn and we all need motivating from time to time. 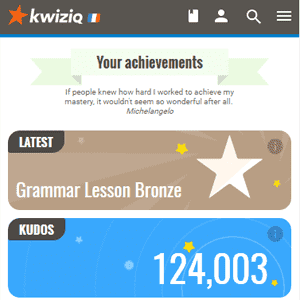 Kwiziq has an awesome awards and achievements system to inspire and encourage you. You gain kudos points for all of your learning successes, small and large. You rack up bronze, silver and gold stars for achieving levels of confidence in specific grammar topics. There are badges to be earned for consistent and productive study behaviours, and every level has a bronze, silver and gold shield for you to work toward, representing basic competence, proficiency and mastery in that level. Last – but most important of all – you can earn Level Foundation Trophies by going back over earlier levels and perfecting your foundational skills. We also have a public leaderboard which shows the top kwizzers every month, and the competition is getting pretty hot! And of course, you can brag about your achievements on Facebook and Twitter. Learning with other people can make learning Spanish more fun! We have a growing set of social learning tools and Features for Teachers. You don’t have to be in a class, for example, to take advantage of our StudyGroups feature: set one up for your friends or family to coordinate learning, share homework, collaborate and even compete. If you are in a class, then your teacher can use these features for free to assign you lessons to practise. Since KwizBot marks and tracks everything, all your teacher has to do is check your progress to know what to work on with you next.